Transform your kitchen with beautifully designed appliance pulls and handles. 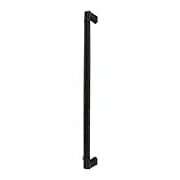 Perfect for replacing the pulls or handles on your built-in refrigerator, freezer or dishwasher. Also work well on large or heavy pantry drawers and cabinet doors. The Queensway Appliance Pull with Fluted Bar is the ultimate decorative accessory for your kitchen. 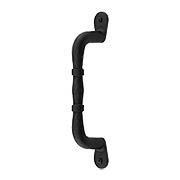 Designed for use on your dishwasher, refrigerator, or freezer, it makes an impressive handle for your pantry, and for large or heavy drawers as well. The lush and intricate pattern is precision cast in pewter, and comes in an array of classic finish options. Made in the USA. The Somerset Weston Appliance Pull (12" CTC) is an elegant choice for traditional interiors. It features a simple, clean design and round finials. Crafted from solid brass, it comes in an array of classic finishes. Both understated and practical, our Ultima II Bar-Style Appliance Pull (18-Inch Center-to-Center) is suited to a variety of interior styles. Made of solid brass, it features simple, linear lines, and comes in an array of popular finish options, making it easy to match any decor. The versatile design of the Menlo Park Appliance Pull (15-Inch Center-to-Center) combines the best of traditional and contemporary styles. Offered in an array of classic finishes, this sleek design features clean lines and a geometric profile. The look is both subtle and sophisticated. The Belcastel 12" Center-to-Center Flat-Bottom Appliance Pull offers Colonial style with a hint of old-world charm. Lending a nostalgic look, this accent features straight lines and a minimal design. It pairs beautifully with river rock or other natural design elements in your kitchen. Choose from an array of unique finishes. 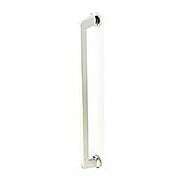 The understated style of the Lily Appliance Pull (12" CTC) is a must for modern interiors. This understated design features a sleek design and plain disposition. An array of finish options makes it easy to match your decor. The Ascendra Appliance Pull (12" CTC) is a nod to the American Arts and Crafts movement. Fresh yet somewhat stately, it features straight lines and simple design of the era. Choose from an array of popular finish options. 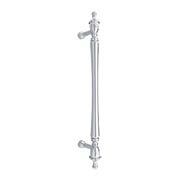 The Empire Appliance Pull (12 Inch CTC) lends classic style to your kitchen. This striking accent features hexagonal bases, a sturdy feel, and comes in an array of popular finish options. Versatile in design, it fits in with a variety of interiors. With its traditional design and sleek, clean lines, our Normandy Appliance Pull (18-Inch Center-to-Center) is at home in a variety of interiors. Crafted from solid brass, this durable accent comes in an array of classic finishes, making it easy to match your kitchen decor. The Artifex Appliance Pull (12 Inch CTC) is a fitting choice for any kitchen. A perfect combination of rustic and refined, this simple accent features a classic silhouette, distressed surface, and polished finish. The Somerset Melon Appliance Pull, 12in. CTC is an elegant choice for traditional interiors. It features subtle curves, reeded accents, and understated finials. 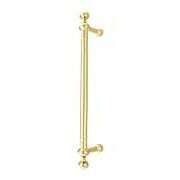 Crafted from solid brass, it comes in an array of classic finishes. Our Reeded Appliance Pull (18-Inch Center-to-Center) is where Colonial style meets Classical design. 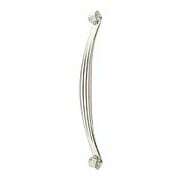 The smooth curves of this appliance pull are contrasted by a reeded motif for an understated, yet elegant look. With an array of classic finishes to choose from, it is easy to match your décor. Reminiscent of mid 18th-century style, the Trevi Appliance Pull is an elegant addition to your décor. Featuring a rococo inspired crisscross pattern, it comes in an array of popular finishes to coordinate with your kitchen hardware and lighting. The Tahoe 12" Center-to-Center Appliance Pull offers subtle rustic style in classic shapes. Both versatile and durable it features a geometric silhouette with double twists. Choose from an array of slightly distressed finishes. Inspired by the American Arts and Crafts movement, the Ruskin collection echoes the straight lines and simple design of the era. This appliance pull features a rustic, handcrafted look complete with pyramid head accents. Fully concealed mounting offers clean sophistication that can be installed in minutes! Suited for more formal interiors, our Tuscany Appliance Pull (12-Inch Center-to-Center) features traditional styling and a thoughtfully placed reeded pattern. 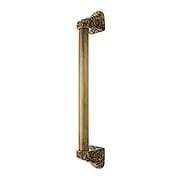 Made of solid brass, it comes in an array of popular finishes, making it easy to match any decor. The Asbury Appliance Pull (12" CTC) is an elegant choice for traditional interiors. It features subtle curves, stepped rings, and understated finials. Crafted from solid brass, it comes in an array of classic finishes. The Kara Appliance Pull (12" CTC) is an elegant choice for traditional interiors. This understated design features a sleek profile and ringed accents. An array of finish options make it easy to match your decor. Sutton Place knobs and pulls celebrate classic style with a metropolitan twist. Featuring crisp stepped shapes and beveled edges, this clean design adds the finishing touch to both formal and contemporary interiors. A wonderful way to update your dresser or sideboard as well! It come in an array of classic finishes. The Somerset Finial Appliance Pull (12" CTC) is an elegant choice for traditional interiors. 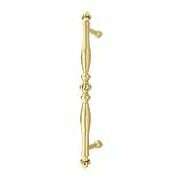 It features subtle curves, ringed accents, and decorative finials. Crafted from solid brass, it comes in an array of classic finishes. The Aurora Appliance Pull (12-Inch Center-to-Center) brings classic good looks and vintage charm to traditional interiors. Crafted from solid brass, this minimal design comes in a array of popular finish options. 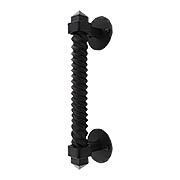 Features decorative, non-working screw heads. Easy rear-mount installation. The Northport Round Base Appliance Pull (15 Inch CTC) is minimal in style and practical in design. At home in both traditional and modern interiors, it features a crisp, clean look and comes in an array of finish options. What a cool alternative for any kitchen! The Delgado 12" Center-to-Center Appliance Pull brings a crisp, clean look to your decor. Its sleek silhouette and stepped design comes in an array of rich finishes. What a polished addition to your kitchen! The 12" Center-to-Center Lille Appliance Pull is a timeless classic. This aerodynamic design features a stylized palm leaf with delicately curled ends. It brings a clean and elegant period look to a variety of interiors. The Lafayette 12" Center-to-Center Appliance Pull adds a dash of French flavor to your decor. Featuring smooth lines and sharp curves, this elegant pull comes in an array of classic finishes, making it easy to coordinate with your kitchen hardware and lighting. 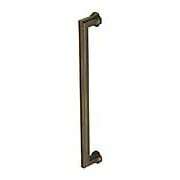 The Ginkgo Collection appliance pull adds a new level of distinction to your kitchen cabinets. Designed for use on the dishwasher, refrigerator and freezer, it makes an impressive handle for your pantry, and for large or heavy drawers, as well. The lush and intricate pattern is precision cast in pewter, and comes in matching knobs and pulls. Made in the USA. 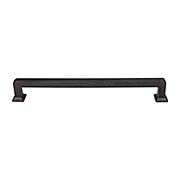 This heavy-duty, 17-century style pull features 12" of solid iron. Hand forged and hammered by skilled artisans, it is ideal for Colonial, Tudor, or other European-era homes. Its surface is phosphate treated then lacquered, for rust-resistant, long-lasting wear.